Capaccio Environmental Engineering, Inc. (Capaccio) is pleased to announce that Cristina Mendoza was selected as a 2017 Environmental Business Council (EBC) Ascending Leader Award recipient. The Award recognizes young, ascending professionals in the energy and environmental sectors who demonstrate exceptional leadership and industry involvement early in their careers. Recipients are also considered leaders within their respective companies, who manage high profile projects and provide mentorship to their peers. They are active in their communities both professionally and personally through leadership positions in business associations, non-profit organizations, and civic groups. Ms. Mendoza is an Environmental Scientist at Capaccio, an award-winning, women-owned, 30-person environmental, health and safety consulting and engineering firm based out of Marlborough, MA. While still in college/graduate school, Ms. Mendoza began working as an intern at Capaccio and quickly demonstrated her capabilities and willingness to learn by assisting with several high profile projects. In 2015, she was hired full-time as an Environmental Scientist/Sustainability Consultant and continued to further develop her knowledge and expertise in the sustainability arena. She also became involved with EBC’s young professionals and became a member of EBC’s Ascending Professionals Committee (Member since 2013 – Leadership Team Member since Summer 2014) and planned a program event on sustainable, responsible, impact investing. She also began serving as a member and facilitator of the Associated Industries of Massachusetts (AIM) Sustainability Roundtable, which plans and executes events throughout the year on sustainability topics. In January 2016, she was promoted to the ES II level, and increased her responsibilities by also becoming the leader of Capaccio’s Sustainability and Systems group. In this role, she lends her technical expertise, ensures internal resource development, and facilitates technical group strategy. Her knowledge has been tapped in live presentations such as the 2017 SESHA (Semiconductor Environmental Safety and Health Association) Symposium where she presented on the topic of ‘The Power of Aligning EH&S with Business Aspirations’. Ms. Mendoza holds a Bachelor of Arts in Environmental Science (2014) and a Master of Business Administration (MBA) (2015) from Clark University. 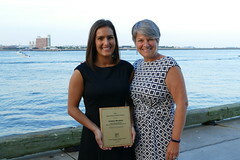 Other recipients of the award included Lauren Ballou, Environmental Planner, VHB; Kathleen Brill, Associate, Foley Hoag LLP; Heidi Lemieux, Senior Project Engineer, Sanborn, Head & Associates, Inc.; and Matthew Waldrip, Environmental Engineer, Eversource Energy. 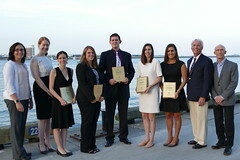 Recipients were honored on August 10 at the EBC Annual Summer Garden Party in Boston, Massachusetts. Now in its 25th year, Capaccio lives and breathes its mission of “helping industry and the environment prosper” with a commitment to leading our industrial and institutional clients toward sustainable growth. Through our responsiveness, integrity and cost-effective solutions, we have enabled our clients to become among the leading greenest and financially performing companies. In 2016, CAPACCIO was named #1 Best Firm to Work For by Zweig Group. Visit us at www.capaccio.com or learn more about our total solution the EHS DashboardTM at www.ehsdashboard.com.